FK Floor Sanding is an accredited and family-run floor sanding and restoration company in London. We provide high quality wood floor services. Our services are provided at highly competitive prices. We take great pride in the excellent reputation that we have built over many years as a trusted floor sanding and restoration company. It is no accident that many of our clients come to us as a result of recommendations from our existing, satisfied clients. All our staff members and craftsmen are fully committed to service excellence and putting the client first. FK Floor Sanding offers floor sanding, fitting, care, restoration and wood floor repairs services in all Central and Greater London areas. Our team members and all the services we offer are fully insured. Our floor restoration teams consist of skilled, reliable and experienced craftsmen. The wood floor sanding and care professionals use specialised equipment such as dust-free machines. Regardless of whether a client has parquet flooring, pine and hardwood flooring, our craftsmen can restore the natural beauty of the wood. We also carry out restoration or repair work on damaged floors and replace missing pieces of timber as necessary. Our goal is to restore flooring to its original beauty. The equipment and oils, varnish and other materials that our teams use are specialised and they don’t produce strong odours or fumes. In addition, we use ethically sourced woods and eco-friendly products whenever possible. Fully insured wood floor services and staff members. 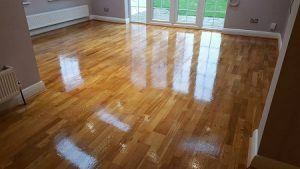 An established floor sanding and restoration company based in London. A one-stop shop that offers floor sanding, fitting, care, restoration and repair services. Quality wood flooring made from a range of timbers. A variety of flooring styles and colours ensuring a wide choice. Wood that is high quality and ethically sourced. Flooring that is durable and has a natural warmth. Highly skilled, reliable and experienced craftsmen. Wood floor sanding and care professionals who use specialised equipment. Craftsmen who can fit or care for parquet flooring, pine and hardwood flooring. A company that uses products that don’t produce fumes and are eco-friendly. Flooring that can be fitted over central heating. Highly competitive prices and no hidden costs. Quick response times due to access to timber stock and the necessary materials. Flooring that adds beauty, character and value to the property. A company that provides excellent before- and after-sales services including advice on floor care. Floors that are easy to care for thanks to the high quality finishing. An organisation that offers a quality guarantee on work and materials. For further details about our floor sanding company in London or to arrange a visit, please call us on 020 3909 7641 We look forward to being of service to you. Keep up to date with the latest news at FK Floor Sanding. We’ll inform you of new projects, success stories and special offers.